This tavern is literally the most populated place in the Realm. You may recall at the end of the last session, I was trying to figure out what to do. The king had told me that the wizard Bessak might help, but the front door to Bessak’s keep was locked, and I had no way in. I decided to regard the world as an open possibility, and I began exploring counterclockwise around the coast. 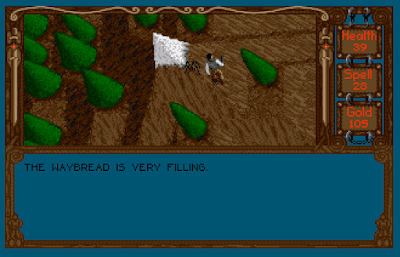 I first came to an unnamed hamlet west of Murkvale, where there were a couple of fields of grain, a few houses, and a general store. I bought a length of rope, a canteen, two torches, and two matches in the store. There was a shrine further along the road, but I couldn’t figure out anything to do there. Soon I came into Murkvale for the second time. I found more structures this time–it’s very easy to miss parts of cities because the exploration window is so small, and I don’t have “Fistak’s Mapping Spell” yet. 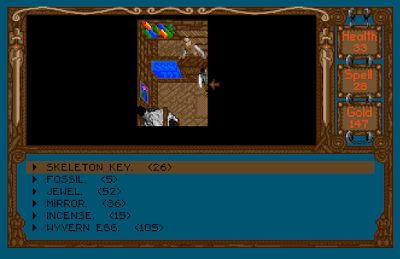 In the tavern, one of the patrons had a crystal key around her neck. She said she was a “poor wizard’s wife, drowning the loss of her husband with buckets of ale.” I thought the key might be what I needed for Bessak’s keep, but she slapped my hand every time I tried to take it, and the only other option–give her a drink–didn’t seem to produce any effect no matter how many drinks I gave her. The bartender warned me about “maneat plants” along the road. Other patrons talked about an island covered with gold in the southeastern ocean, and one said that Bessak was seeking the Druid Book of Life. That might be a clue. I had previously stopped at the Druid Temple (I think I forgot to relate it in the first entry) but couldn’t find a way in. Another new building was the bank, where I deposited 20 gold pieces. On an island east of the city, I found a place where I could rent or buy a raft. 50% interest and I have to pay it back the next day? Hell, yeah! The biggest new discovery, however, was a “guild shop” in the northeast of town, where I could take several “continuing education” courses. I only had enough for one class, so I took “Swords for Beginners,” and supposedly was trained in better use of the sword, though it didn’t reflect anywhere in my statistics. I sold a couple of excess items at the armory and returned to take “Basic Spell Casting,” but the guildmaster said that I needed 750 experience points. That was about 100 points shy of where I was, so I went grinding for a while. 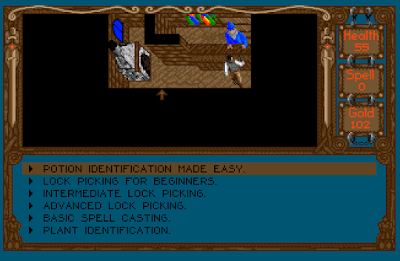 This ultimately provided enough money to take two courses when I got back, so in addition to “Basic Spell Casting,” I took “Lock Picking for Beginners.” Once I took the spellcasting class, I started to earn magic points (although I still have no spells to cast). The lock-picking class came with a set of picks. There was nothing happening at an unnamed hamlet northeast of Murksdale, on the east coast, so I kept going north. I eventually came to a walled watchtower with a locked door. I couldn’t pick it, but the town across the river had a general store that sold iron keys. One of those keys got me through the door. There were two guards inside, and neither seemed perturbed that I had just broken into a watchtower. One, in fact, was drunk, and I had the option to rifle his pockets. The other, named Taran, told me that the realm had not been attacked in over three hundred years. 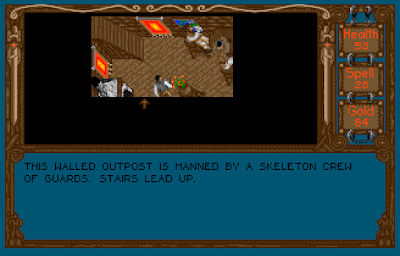 This whole kingdom is run by a skeleton crew. I followed the road northwest out of the hamlet, then took a branch that bypassed the castle. The road came to an end at the northern coast, at an unmanned watchtower that wasn’t on the map. There was nothing there. The road curved west and led to yet another outpost, where I found a dagger. I suppose, if nothing else, all these outposts would serve as a place to rest if you were in the area at night. A mountain to the southwest had an icon on the map that suggested a dungeon, so I walked towards it. When you walk up a mountain in the game, the graphics and movement actually suggest a character elevating up a slope, which is an interesting addition to this type of perspective. You kind of have to see it in animation, but I’m walking “up” this mountain. I found a mine entrance with a shop next to it called “Stantho’s Occult Goods.” It sold weird items that seemed like spell reagents. I bought a skeleton key but didn’t have money for much else. I have a feeling that these all are going to be a solution to a quest or a spell. 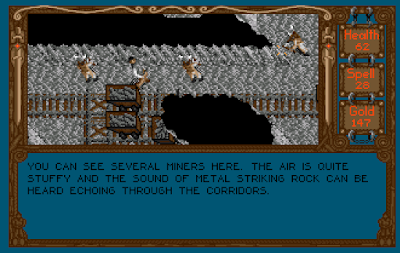 The entrance led to a two-level mine where dwarves worked with picks. There were mining carts on tracks that I could push around. Gems gleamed in the walls, but I didn’t have any tools to extract them. None of the dwarves were interested in talking with me. I do like the environmental descriptions. Night was falling when I left the mine, so I returned to Castleguard to sleep. While in town, I found a library (missed before) which had a few clues among the books, including the four sacred trees of the druids and a hint about other worlds existing through portals. 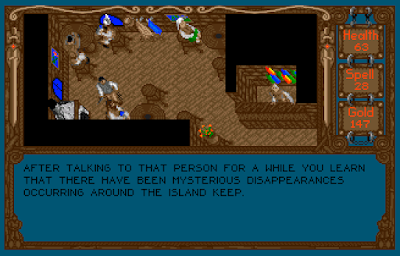 In the tavern, a patron talked about mysterious disappearances “around the Island Keep,” a castle off the northwest coast. I returned in the end to Bessak’s keep, just to make sure one of the iron keys or the skeleton key wouldn’t open his door, or that I couldn’t pick it now that I had the skills and tools. Nothing worked. My explorations this trip, minus the return to the Dark Forest at the end. 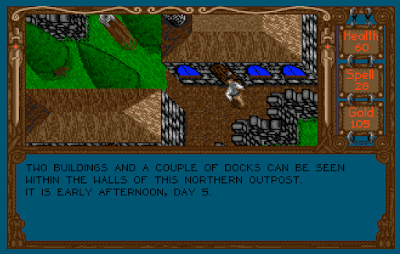 Throughout these explorations, I routinely fought, and was often killed by, the only four enemies I’ve encountered so far: spiders, some kind of undead, some kind of fighter or dwarf, and wild dogs or wolves. They spawn so often that you’re rarely truly alone on the road. My experience has been increasing and with it my hit points, but I haven’t seen any signs of improved combat effectiveness. Combat remains a joyless affair in which the difference between victory and death often comes down to a few pixels in one direction or another. Examining items gives you a one-paragraph description. 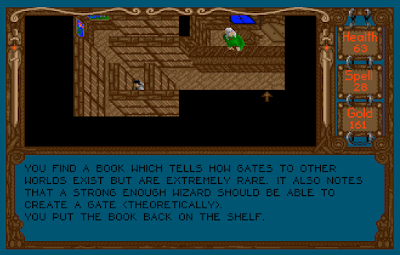 The descriptions aren’t terribly interesting, but I like games that offer them, and such games are rare in this era. 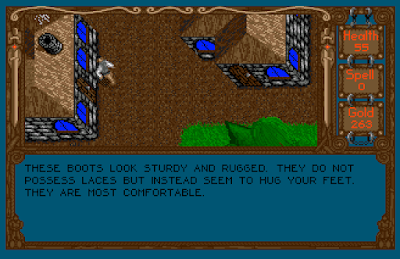 A description of some hiking boots. Each shop allows you to try to steal. It’s tempting, but failure means that you get kicked out, and the shopkeeper refuses to do business with you permanently. You could save-scum, but you can only save outside of shops, and there’s a long loading transition between buildings and the outdoors. I haven’t needed anything that bad that I couldn’t afford. Particularly with my color-blindness, these plants are annoying. It was right in the middle of the road, too. This game world is huge, sparsely populated, and devoid of any clues . . . . I’ve slaughtered countless ogres, goblins, skeletons, and phantoms, built up my bravery and vitality to epic levels, and yet I have no idea what to do next . . . . It’s like I started the game too late, the evil necromancer has already won, and I’m one of the last five people alive. The same emptiness and gloom pervade this game. Each city has about five people, and they’re all in the tavern. No one appears in the private homes even at night. No one is out and about on the roads. Shops don’t have any signs out front to advertise that they’re shops. The king sits alone in an empty castle. Most of the buildings you stumble upon have no people at all. I hasten to add that, if intended, this would be a great setting for an RPG–some kind of post-apocalyptic world, empty except for monsters, in which you have to piece together what happened from notes and other evidence. I’m just not sure that such an atmosphere in Lords of Time is deliberate. I guess I’ll keep exploring the map. 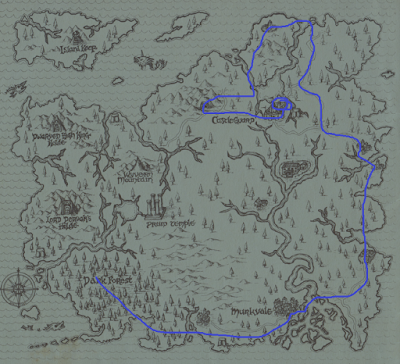 I still have to check out the northwest, including the Dwarven High King Holde, Lord Dervak’s Holde, Wyvern Mountain, and (if I can reach it) Island Keep. 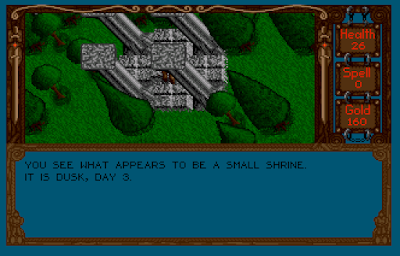 There also appears to be one town I missed south of Castleguard. 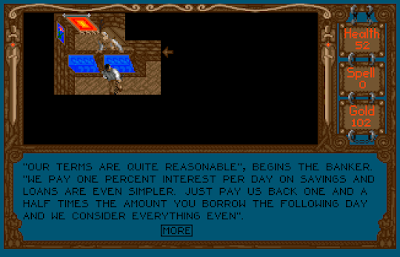 But it might be time for explicit hints if any readers have played the game. 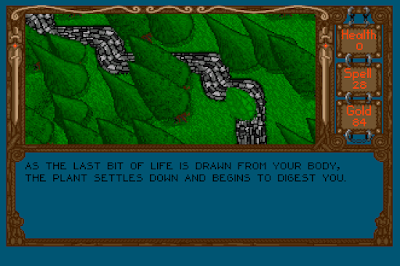 PREVIOUS POST Previous post: Night Knight – A new Juan J. Martínez (Reidrac) game in dev for the MSX! NEXT POST Next post: The CRPG Book: A Guide to Computer Role-Playing Games launches for pre-orders!